Kimitec Bombardier is a new generation of fertilizer with an exclusive formulation. Bombardier Sugar increases the synthesis of sacarose. Through this we obtain a direct effect in ripening and increasing in Degrees Brix (ºBx). As a consequence, the size and quality of fruit is improved as well as the sugar content of the fruit. The product is based on fundamentals and benefits of amino acids, fulvic acids, organic matter and polysaccharides inside the fruit. 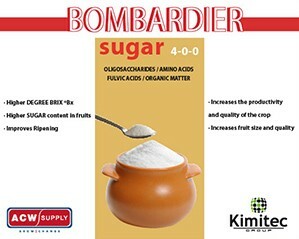 Kimitec Bombardier Sugar is a new generation of fertilizer with an exclusive formulation. Bombardier Sugar increases the synthesis of sacarose. Through this we obtain a direct effect in ripening and increasing in Degrees Brix (ºBx). As a consequence, the size and quality of fruit is improved as well as the sugar content of the fruit. The product is based on fundamentals and benefits of amino acids, fulvic acids, organic matter and polysaccharides inside the fruit. This product increases the synthesis of SACAROSE. Through this we obtain a direct effect in ripening and increasing in Degrees Brix (ºBx). As a consequence, the size and quality of fruit is improved as well as the sugar content of the fruit. Based on fundamentals and benefits of Aminoacids, Fulvic Acids, Organic Matter and polysaccharides inside the fruit.